'Major Powneys dining room at Ishapore on the Hoogley 3 miles above Barrackpore. Yonder big trees mark the ferry for all dâk travellers'. bl.uk > Online Gallery Home	> Online exhibitions	> Asia, Pacific and Africa Collections	> 'Major Powneys dining room at Ishapore on the Hoogley 3 miles above Barrackpore. Yonder big trees mark the ferry for all dâk travellers'. 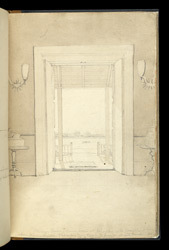 Pencil and wash drawing taken from a house interior looking outside by Joseph Scott Phillips (1812-1884) in 1833. This is from an album of drawings (46 folios) made in 1833 while Phillips was a supernumerary Second-Lieutenant at Dum Dum. They are mostly views, some covering a trip through the Sunderbans to Dacca, in pencil or water-colour, with a few removed, leaving inscriptions. Richard Pownney (1786-1864) served with the Bengal Artillery and was Gunpowder Agent at Ichapur from September 1832 to July 1835.